Step 1 Trim the artichokes: Fill a bowl with a couple of quarts of cold water, and squeeze in the juice of one-half of a lemon . Trim the artichokes one at a time, first snapping off the thick outside leaves, until you reach the tender, pale inner leaves. Trim the tip of the stem, but leave most of it attached to the base of the artichoke. With a sharp paring knife or vegetable peeler, shave off the dark skin of the stem, exposing the tender core. Peel around the base of the artichoke too, removing the dark-green spots where the tough leaves were attached. Cut across the leaf tips, removing the top third of the artichoke. Slice the entire artichoke in half lengthwise, splitting the bulb and stem and drop the pieces into the acidulated water. Step 2 Bring a medium pot of water to a simmer. While the water is heating, season it well with a few tablespoons of salt. Juice the remaining half of the lemon. Set aside 1 tablespoon of the juice, and pour the remaining juice into the pot of water. Step 3Drain the artichokes, and place them in the simmering water. Simmer the artichokes until tender, 6 to 9 minutes. Drain well. Heat the broiler. Step 4Make a garlic aioli: Using an immersion blender, combine the egg yolks, a pinch each of salt and white pepper, the water, the remaining tablespoon lemon juice and minced garlic cloves in a 2-cup measuring cup or in the tall beaker used for immersion blenders. Stand the immersion blender in the measuring cup, then slowly pour in the oils so they settle on top of the other ingredients. With the blender held against the bottom of the glass, pulse until the mixture begins to emulsify, which will happen almost immediately. Continue to pulse, turning the blender a bit, but keeping it pressed against the bottom of the container. Keep pulsing until most of the mayonnaise is emulsified, less than 1 minute, then slowly plunge the blender a bit to mix thoroughly. Taste the aioli and adjust the seasoning and flavoring with additional salt, pepper and lemon juice as desired. This makes about 1 cup aioli. Step 5Alternatively, to make the aioli using a whisk: In a large bowl whisk together the yolks, a pinch each of salt and white pepper, the water, the remaining tablespoon lemon juice and the minced garlic cloves. Whisking continuously, add the oils in a very, very slow stream until the aioli thickens and all of the oil is incorporated. Taste the aioli and adjust the seasoning and flavoring with additional salt, pepper and lemon juice as desired. Step 6Whip the cream: Beat the cream in a large, chilled bowl using a whisk, or in the bowl of a food processor, until whipped to firm peaks. This makes a generous cup of whipped cream. Step 7In a large bowl using a spatula, gently fold the aioli into the whipped cream to make a mousseline sauce. Gently fold in the grated Parmigiano-Reggiano. Taste the mousseline sauce and adjust the flavorings and seasonings as desired. In Recipes-list.com we have selected the most viewed recipes from category - Main courses Quick and easy . Enjoy the best recipes specially selected for you! 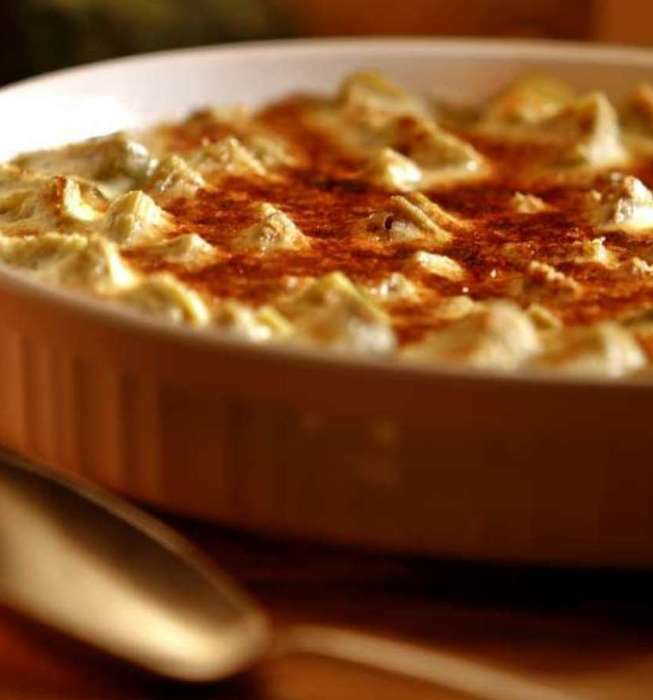 Baby artichoke gratin is the right choice that will satisfy all your claims.